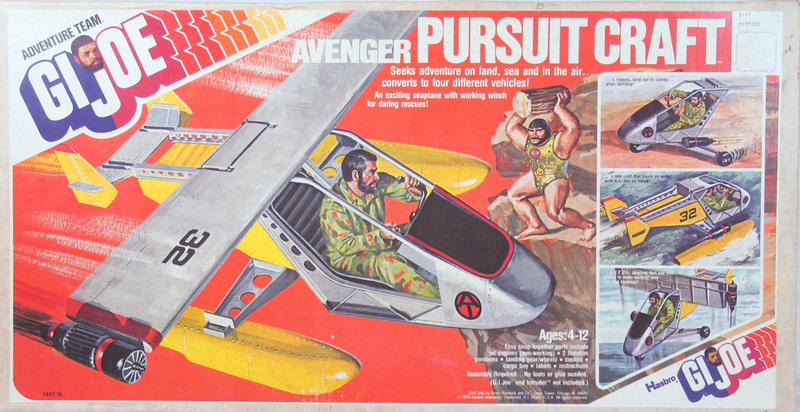 The Avenger Pursuit Craft (7497.16) is proof that the idea mill had not run out, even late in the line. It's a modular vehicle that can work as a sea plane, a vertical take-off and landing plane, a jet boat, or a rocket car. Add to that a working winch and a big cargo container to carry Joe's gear and you get lots of play value. Not too shabby! The set was a Sears exclusive for 1976. Above, boat mode. below, rocket car. Above, Joe gets ready for VTOL take-off. Below, he tries to make sense of all the pieces. Where's that instruction sheet?